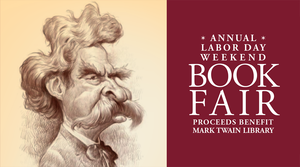 The Mark Twain Library has held a late-summer book fair for more than 50 years. It is held on Labor Day Weekend, August 31 through September 3 in the Redding Community Center. Over 65,000 books for sale organized in 75 categories! FREE ADMISSION: except $20 Early Buying charge from 9 – 10 am on Friday, 8/31. Free parking. At this annual event, the library typically offers for sale upwards of 50,000 used books in all subject areas. A select number of books are also available for sale year-round at the library. This important contribution to the welfare of the library is made possible by the generous donation of books to the library throughout the year, and the year-long effort by a devoted group of book fair volunteers, who sort and store these donations. Donations can be dropped off at the library during regular hours of operation (preferred) or in the outside bin at the end of the children’s wing when the library is closed. The library will be happy to provide a receipt for any donation, but cannot, of course, provide a valuation for tax purposes. But, if you have any questions about a specific donation that you would like to make for the book fair, please contact volunteers Jeanne Wendschuh or Midge Loery at the library (203) 938-2545. Book donations are ACCEPTED through July 31st.